'Love Thy Neighbour' a new Channel 4 series stars Phillip Olanipekun, a graduate of OBV’s 2010 Parliamentary Shadowing Scheme. Phillip who shadowed Minister of State, the Rt Hon Oliver Letwin will be a fixture on our screens when the series starts on Thursday 3rd March at 9pm. 'Love Thy Neighbour' is set in anidyllic village in the Yorkshire Dales where 12 competing families vie to win the chance to move in to their picture perfect lifestyle, and they get to decide who stays. The village of Grassington is traditionally English in every way; white, middle class and largely conservative; a tight-knit village community where everyone really does know everybody and their business. But it is in dire need of new blood. Will the residents be prepared to embrace change as families from all walks of life, racial backgrounds and sexualities battle it out to win their hearts and change their minds, in a bid to win their dream life in the country and a £300,000 cottage? 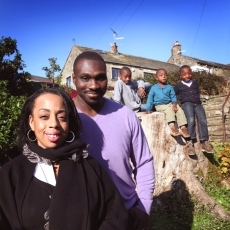 The real driving force behind my appearance on the new reality show (dare I say it) was my wife, Simone who coupled with the idea that we could win a lovely cottage in the Yorkshire dales also felt that it would be a good opportunity to expose our children to a different way of life. And why has an aspiring politician decided to take part in a reality tv show? “I must confess that although I have made appearances on television before, this particular venture concerned me due to the negative press that ‘reality tv’ receives. “Nonetheless and against my better judgement we ploughed full steam ahead in attempting to win a cottage in a village where they may or may not have had much contact/communication with ethnic minorities other than the stereotypes portrayed in the media. “The experience was truly enlightening and as a family we learned an enormous amount about our own relationships and indeed the relationships we have with other people. “There were those in the village who were undoubtedly suspicious of us; however this had more to do with us being ‘new’ as opposed to us being from a different ethnic background. “I was also able to indulge in a little ‘political’ campaigning as we tried to convince the villagers that we deserved an opportunity to win this fantastic prize. Main picture: Phillip and family. Submitted by Yinka Oyesanya (not verified) on Sun, 22/05/2011 - 19:56. "“There were those in the village who were undoubtedly suspicious of us; however this had more to do with us being ‘new’ as opposed to us being from a different ethnic background." If you stay a lot longer than the show permits, then reality will dawn on you. "The village of Grassington is traditionally English in every way"
How did you gather this? My research shows that England has been in existence for well over: "The earliest known evidence of human presence in the area now known as England was that of Homo antecessor, dating to approximately 780,000 years ago." If this is true, there must have been alot of changes over that period?